I just love this travel tote bag from Allendales. This is a red/white/blue design which is great for summer. 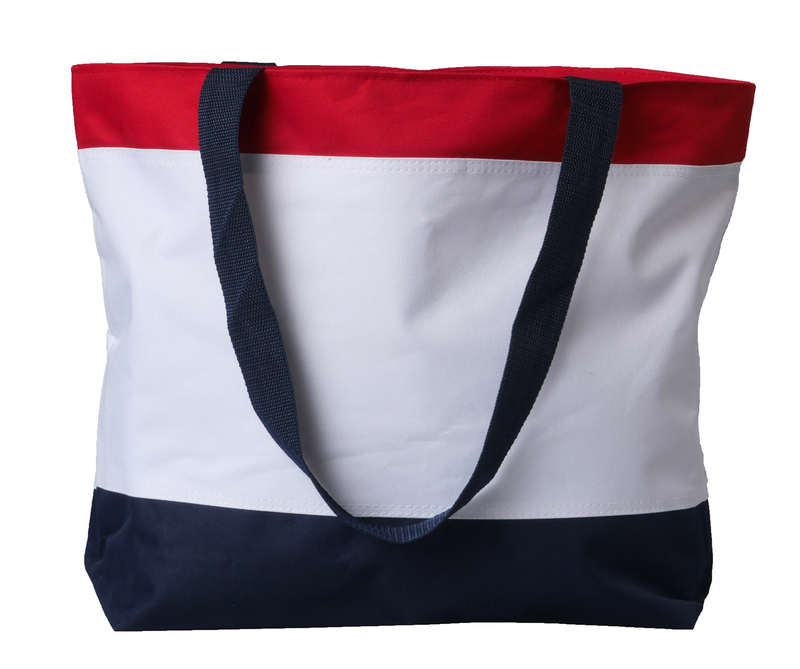 It almost reminds me of those classic navy themed bags with the navy blue, white and red stripes. It has large shoulder straps on both sides so it’s really easy to pick it up and tote it around. It has a zipper that encloses everything inside, there is a small zippered pocket inside as well, I like to put valuable things in there like money, etc. This bag is really well made, sturdy material and the seams are beautifully stitched. No worries about unraveling, tears, rips, etc. This bag is a perfect bag for the beach or pool. We use ours for the pool mostly. It’s large enough that we can fit 3-4 beach towels, bathing suits, water toys, sunscreen, flip flops, and we still have space. It’s a great size and perfect for those summer trips! Put wet swims suits in this bag with its water resistant Poly material with vinyl backing. Swim teams also love this bag. 5×7 inch interior zippered pocket located at the top of the bag holds your cell phone, money or keys so they won’t get lost in the bottom of the bag or fall out of the bag. This zippered tote bag is great for a carry-on bag for air travel and keeps your contents from falling out. 12 inch shoulder drop handle with 1.5 inch wide strap is made from durable polyester w/heavy vinyl backing so it won’t tear. You can purchase this bag on Amazon!